The film explores how beliefs about a “pure and true” form of Islam and how teachings of these beliefs in traditional Islamic schools are affecting the society in Pakistan. “Among the believers” focuses on three stories related to the madrassa of Red Mosque - Abdul Aziz Ghazi, referred to as Maulana Aziz, and two of his students – a 12 year old boy called Talha and a 12 year old girl Zarina. Maulana Aziz, a kindly looking tall man who speaks smilingly and gently, is convinced about the need for following the teachings of Islam in a pure and true form. For him this means that Pakistan must have Sharia law, ban music and other un-Islamic practices, enforce veils for girls and women and wage Jihad, the sacred fight against the infidels. Thus, in his madrassa school, young children mostly from poor families, must start learning the Muslim sacred book Quran and listen to his sermons about the pious Islamic lives they all must lead. Talha is a gentle looking boy with a shy smile. He likes cricket and Shahid Afridi and would like to watch the cricket match on TV but he knows that this is against the teachings of Islam as taught in his madrassa. He lacks confidence and during the exam about his skills in remembering and reciting the verses of Quran, he bursts in tears. going to a local branch of Red Mosque madrassa but she was unhappy in the school and thus, ran away and came back to home. She says that girls were kept prisoners in the school, given little to eat and forced to cover themselves in veil. “I am a young girl, why should I cover myself with veil?”, she asks. Her village headman, a man who had not been able to complete his education because of family poverty, has started a school and Zarina starts going to this school. In contraposition to these three stories is Dr Pervez Amirali Hoodbhoy, a Pakistani nuclear scientist and activist who had taught in universities abroad and who argues about the harm caused by this kind of conservative Islamic thinking. The film presents the ideas of Maulana Aziz through his interviews and through observations of the madrassa life, both in Red Mosque as well as, in some branches in the countryside, and how these ideas are leading to a war against ordinary citizens of Pakistan, forcing them to accept increasing Islamisation of their society. One of the first scenes of the film shows a 5 or 6 years old young boy, whom Maulana Aziz introduces as a child from a poor family, whose father had left them and his mother had brought him to the madrassa. Maulana Aziz asks the child, “What do you want to become when you grow up?” The child hesitates and then with a timid smile says, “Mujahid” (a jihadi fighter). To show the lessons he has learned in the school, the child slowly stands up and then suddenly changes his expression and the tone of his voice, his hand moving up and down like a knife, cutting the air in front with precise strokes as he recites, “Look at the sacrifices of the martyrs of the Red Mosque. We will destroy you if you will attack us. You are infidel, you cannot enter here. You cannot conquer us. And if you dare to enter here, we will destroy you in the name of Jihad." The transformation of a shy child into a hard faced fanatic mirroring the expression and voice of his teachers, is one of the most chilling scenes in the film, showing how small children can be indoctrinated till they are filled with hate, willing to destroy themselves and ready to kill all those who are perceived different. In another scene, in a Madrassa branch school in countryside, the local cleric tells the poor family of a young boy that learning Quran will ensure that 10 members of the family who are in dojakh (hell) can go to jannat (paradise) and that Allah will put a crown full of diamonds and jewels on the heads of his parents. Zarina’s story presents hope for the attitudes of her father and the village head, who believe in modern education for their girls. 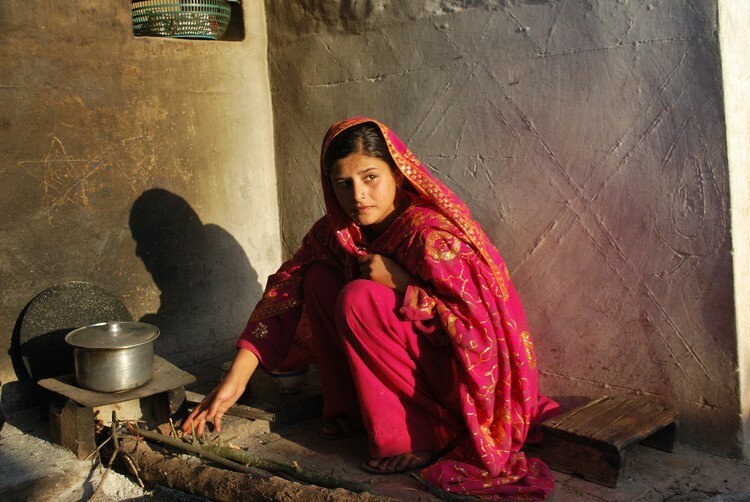 When a woman comes to ask for 14 year old Zarina’s hand in marriage with her son, her father says that the girl is too young and he would like her to continue studying for 2-4 more years. However, as Islamist militants force the closure of their village school, Zarina’s father decides to get her married. Zarina tries to say that she is too young but the decision has already been taken. The desolate expressions of young Zarina putting on make up and dressing up for her marriage are haunting. The end credits explain that Zarina is already a mother of a baby girl. However, it is Talha’s story which despaired me most. As the film moves, the shy, cricket loving gentle boy gets converted into a believer of the pure Islam as taught by Maulana Aziz. After a terrorist attack in December 2014 in a school in Pashawar which killed 136 children, Talha’s father comes to take the boy away from the madrassa. However, Talha refuses to leave. “They call us terrorists, but we are only killing the infidels and safeguarding Islam as asked by Quran, how can we be terrorists?”, he calmly asks. The end credits explain that Talha is continuing his studies in a senior madrassa. The film explains the origin of conservative islamism through the Mujahideen movement in Pakistan and Afghanistan in the 1980s through support from USA to fight the Soviet invasion of Afghanistan. The film includes some clips showing the American president Ronald Reagan talking and shaking hands with Islamist fighters and thanking them for fighting against the Soviets. After the Soviets left, Americans withdrew their direct support but the Islamists found other supporters and funders and continued their activities. One of these supporters and funders who had also visited Red Mosque was Osama Bin Laden. You can watch the trailer of Among the Believers on Youtube. Both Hemal Trivedi and Mohammed Ali Naqvi deserve congratulations for having succeeded in going inside Red Mosque, talking to Maulana Aziz and giving glimpses of the process used in brain-washing of young impressionable minds who will lay down their lives in suicide and terrorist attacks. Through the story of Zarina, her parents and her village headman, the film provides a glimpse into the lives of ordinary persons who do not share these ideals. One of the co-producers of the film, Musharraf Shah, had lost four of his nephews in the massacre of the school children in Peshawar, the film is dedicated to their memory. Protecting our crew’s physical safety was an ongoing challenge. Throughout the five and a half years of production, members of our crew narrowly escaped bomb blasts and experienced several close encounters with gunfights. We also received several death threats and were tracked by intelligence agencies. 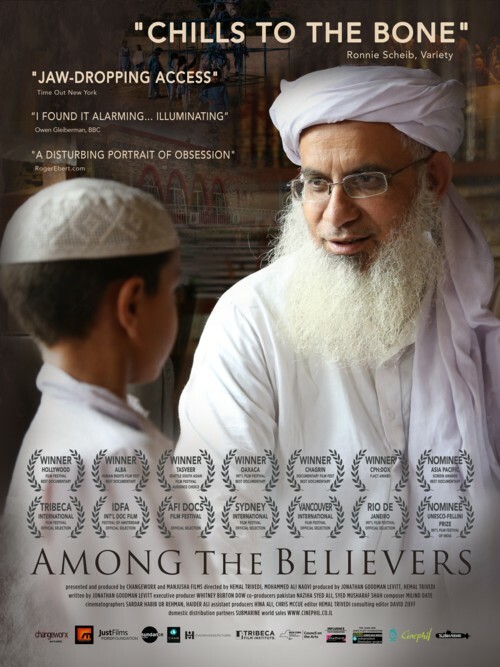 "Among the Believers" has been shown in more than 50 film festivals across different continents (including the Goa Film Festival in India in 2015) and has won 12 awards. Making such films is not without its dangers. The directors of the film have received death threats. It is a scary film since it makes you understand how difficult it can be to fight against and to the change the mentality of boys and girls who grow up surrounded by ideals of hate, suicide and killings in the name of religion. It is also important to see how the religious fundamentalism is harming the Pakistani society itself and affecting the lives of millions of young girls and boys in that country. Along with feelings of fear and disgust, I could not help feeling pity for those boys and girls in the traditional Islamist madrassas, who have no way to defend themselves against this kind of hateful teachings. The film glosses over some of the key issues in terms of links between persons coming out of these madrassa and India. For example, the film never mentions the role of Pakistani army and ISI in maintaining and supporting the radical Islamists in Pakistan after the departure of Soviets from Afghanistan and the withdrawal of American support because they were used for waging war against India in Kashmir and elsewhere. While different persons in the film express their anguish at the havoc wreaked by terrorists in Pakistan, the film also glosses over decades of silent acceptation and support these institutions and persons must have received as long as their targets were in other countries, especially in India. Now that the religious conservatives nurtured to create terror in India and Afghanistan have turned inwards towards Pakistani society, as well as their spread towards ISIS and other terrorist networks affecting middle east, Europe and US, suddenly the whole world is asking about the role of traditional madrassas in Pakistan. Recent films and novels, often equate Pakistan with terrorism. Would Pakistan government, army and ISI understand the need to eradicate these structures and if yes, would they have the power to do so, are questions that do not have any answers yet. The one hour and 22 minutes long film is definitely worth a watch, both to understand the kind of persons who come out of the radical Islamist schools, as well as to see how ordinary people in Pakistan are also being affected by it. Most mainstream media usually try to ignore or down-play anything related to radical Islamists. This is done both, for not promoting Islamophobia and for not provoking negative stereotypes against ordinary Muslims. However, as the film shows, the spread of conservative Islamist ideology is a great danger to the ordinary Muslims themselves. Other countries and people considered infidels risk terrorism and will need to fight the terrorist attacks. However, Muslims themselves risk much more - losing their culture, their arts, their education, their professions, their daily lives and their ordinary freedoms, under the spread of radical Islamist ideology. It does not target only the non-believers, it also creates divisions among Muslims themselves and attacks all those who do not belong to the acceptable forms of Islamic beliefs. This film has been banned in Pakistan. Please consider signing the petition on Change.org for showing this film in Pakistan. I also think that the film needs to be shown widely in India for promoting a debate about the impact of influencing young vulnerable minds and how to make sure that we do not allow spread of such ideologies, not just among Muslims, but among all the religions. I watched the trailor of this documentary some time ago, it definitely seems like an important film. I hope I can locate the film here in my area or on the net somewhere. Thanks for this detailed review and analysis of the film. Thanks Beloo. Unfortunately watching documentaries is so difficult since these are not available in mainstream theatres and the only way is to wait for some festival or film-club screening.